In 2015, real estate industry executives Tom Phillips and David Charron began to envision a different way to approach multiple listing services (MLS) that help connect buyers and sellers in the real estate business for its brokers, trade associations and consumers. Traditionally, MLSs have operated in segmented spaces that forced brokers and agents to pay for multiple systems and navigate different interfaces from a variety of sources. Phillips (CEO) and Charron (Chief Strategy Officer) wanted to combine multiple listing services across the Mid-Atlantic region, making use of the MLSs more economical and efficient for brokers, agents and consumers. That idea came to fruition this year, when TREND and MRIS consolidated with seven other MLS systems to form Bright MLS. The service is the MLS for 43 Realtor associations from six states and the District of Columbia, serving about 85,000 real estate professionals. Bright MLS has also developed its Homesnap Pro mobile app to provide access to thousands of listings across the company’s coverage area. The firm is also working to add technology that will allow real estate professionals to search for homes by drive time between their client’s workplace and a particular property. Other MLSs have begun to consolidate as well, and Phillips and Charon said they’re not finished adding more MLSs to their network. Great leadership leads to great things! Both definitely visionaries in addition to the Board of Directors of both firms pre and post merger. 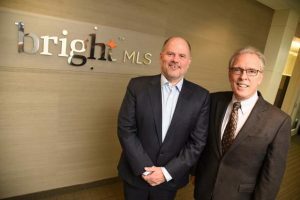 I’am honored to serve with Tom and David as the MRIS Investors’ Treasurer and current BrightMLS Director. Too bad that they have failed us realtors in the region. 3 weeks after conversion we are still battling major issues.